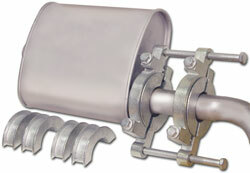 Specially designed to separate crimped, clamped, rusted together exhaust pipes & mufflers from 2-1/2" to 4". Requires a ratchet wrench for use. Grips both sides of the exhaust pipe joint. Turning the drive bolts separates the joint. Uses drop-in jaws to fit 2-1/2" to 4" diameter pipes. Pros: Recently, this tool saved me a lot of time and money. Recently, this tool saved me a lot of time and money. Exhaust pipes with slip-joints held by a clamp are not too common on Corvette stock exhausts, but they are common on aftermarket systems. Companies like Flowmaster, Borla and Corsa may use slip joints to make DIY installation easier and make packaging smaller to reduce shipping costs. The problem is that when a clamped slip joint is properly assembled, they're very difficult to separate at a later date. Say you want to replace the muffler, or disassemble and remove the system to repaint it or recoat it? If the clamps were tightened properly, they will have deformed the slip joint enough that it will no longer come apart. At that point your options are: try and beat it apart with a hammer (at minimum, a lot of work and sometimes unsuccessful) simply cut the pipe (in many cases renders the parts useless) or heat the connection (a useful strategy but sometimes difficult for DIYs). Well, I found a new solution that in many cases can quickly and easily separate even the most tightly-clamped or heavily-rusted slip joints. The E-Z Pull tool, sold by the Eastwood Company (PN 43583), is designed to separate crimped, clamped, rusted together exhaust pipes & mufflers with pipe sizes from 2-1/2" to 4". It requires 5/8" and 3/4" sockets or wrenches for use. The E-Z Pull grips both sides of the exhaust pipe joint. Turning the drive bolts separates the joint. It has drop-in jaws to fit 2-1/2" and 3" diameter pipes. With the drop-in jaws removed, it fits 4" pipe. The E-Z Pull can be used to separate most slip joints, however, there are a few cases where the tool won't work and those are when the E-Z Pulls' jaws cannot be fit over the pipe due to restricted space. The E-Z Pull which we tested fits 2 1/2 - 4" pipe. Eastwood stocks a second, similarly-designed E-Z Pull for 1 1/2 - 2 1/4 pipe-sizes.